The heart shapes are just right to fit all those fantastic ears. Except yours Carson. Your ears don't stick out, but your smile fills your heart cut-out beautifully. Thanks for the reminder to dig out the Valentine's Day card I bought for my wife. And Happy Valentine's Day to you too. Happy Valentines Day to you and all the family at 7MSN!! Adorable. 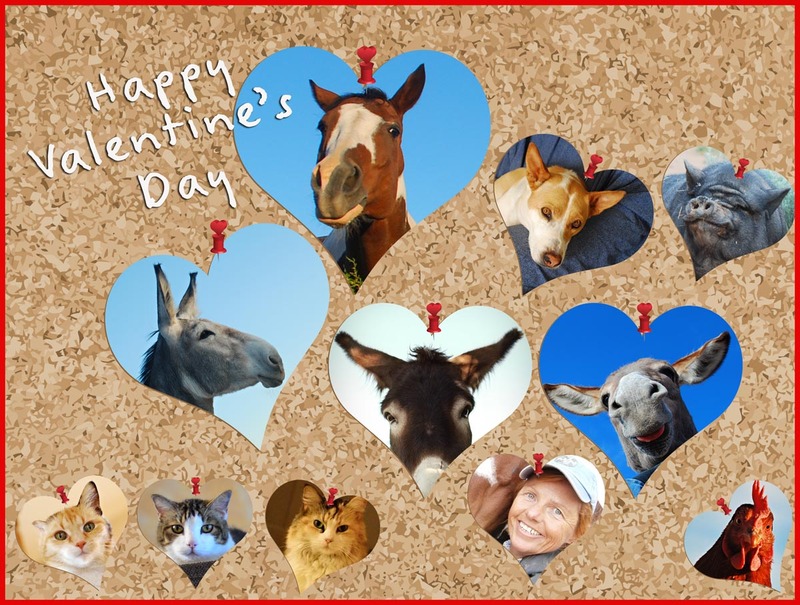 Happy Valentine's Day to you and all the critters. What a wonderful crew - Happy Valentine's Day and hugs and kisses to all of you! Oooh ... ouch ... you have a stick pin stuck in your forehead ... that is NOT good! Maybe move it to your hat ... won't look so painful there! LOL Happy Valentine's Day to you and your critters ... hugs for everyone!! Love back at all of you! (Including Mr.P!) Hoping that the single chicken is just representing all the chickens and not a headcount. Happy Valentine's Day with much love to all!! Awwww that is so sweet! Happy Valentine's Day to you and all at 7MSN too. And all of you are in my heart, too !! So cute. Happy Valentine's Day! What a wonderful cyber-bulletin board!! Well done...however, is George saying 'bah-humbug' or 'kiss me, baby'??!! Thank you for the clever Valentine ... and love and best wishes to all of you too! What's up with the token chicken? !